(Charlotte Higgins, The Guardian, 13 June 2013). Seizure by Roger Hiorns (photo by Loz Pycock, used under CC BY-SA 2.0). Grapes sprayed with Bordeaux mixture on white grapes in the Val Tiberina, Umbria, Italy (by la fattina, used under CC BY-NC-ND 2.0). Organic is a word that has gained different meanings depending upon where it is used. To chemists, organic compounds are generally those based upon carbon, and a compound like copper sulfate, which contains no carbon at all, is classified as inorganic (hence the categorisation of this blog post). 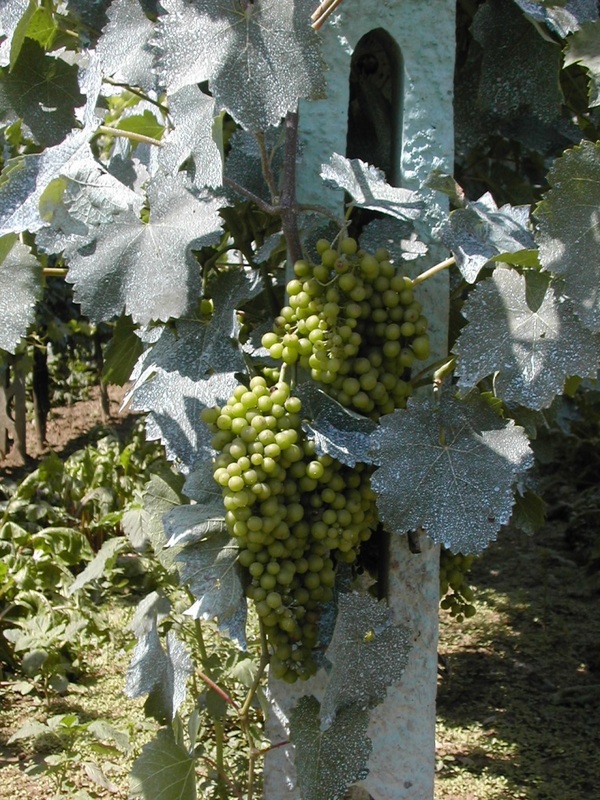 To the general public though, organic has largely become synonymous with natural – organic food is grown without the use of ‘chemicals’ – so it would probably be a surprise to many that organic farmers were allowed to use Bordeaux mixture as a fungicide. As has been pointed out though, copper sulfate is neither safe nor organic (in either sense of the word) (B. Dixon, The Lancet Infectious Diseases, 2004, 594), and its use is a historical anomaly. 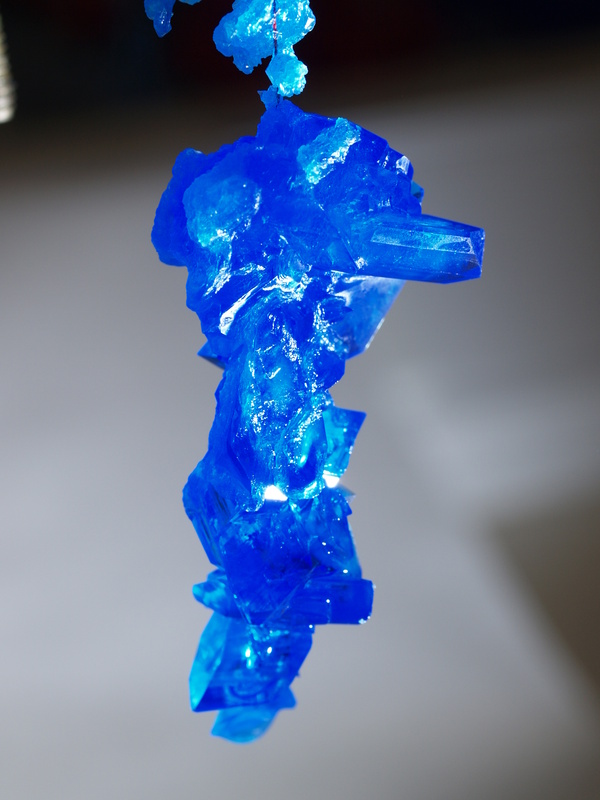 2) The internal structure of blue vitriol contains not just copper sulfate, but also water; its proper name is copper(II) sulfate pentahydrate, and the pentahydrate bit means that there are five water molecules present per copper atom. The colour is created by the copper ion absorbing red light and leaving just the blue for us to see. It only does this in the presence of the water molecules, and, if a sample is heated, then these water molecules will evaporate and the colour will eventually become white (W. E . Garner and M. G. Tanner, J. Chem. Soc. 1930, 47-57). The figure below shows how the atoms are arranged in solid copper sulfate; a crystal of copper sulfate contains gazillions of these units, stretching off as far as the eye can see,* in three dimensions. The copper atom in the middle (brown) is next to six oxygen atoms (red). Hydrogen is white, so you can see that there are four OH2 units around the middle of the copper atom. OH2 is of course water, so these are the water molecules that are required for the blue colour. Sulphur is yellow, so the SO4 entities top and bottom are sulfate ions (G. E. Bacon and N. A. Curry, Proc. Royal. Soc. Lond. A 1962, 266, 95-108). 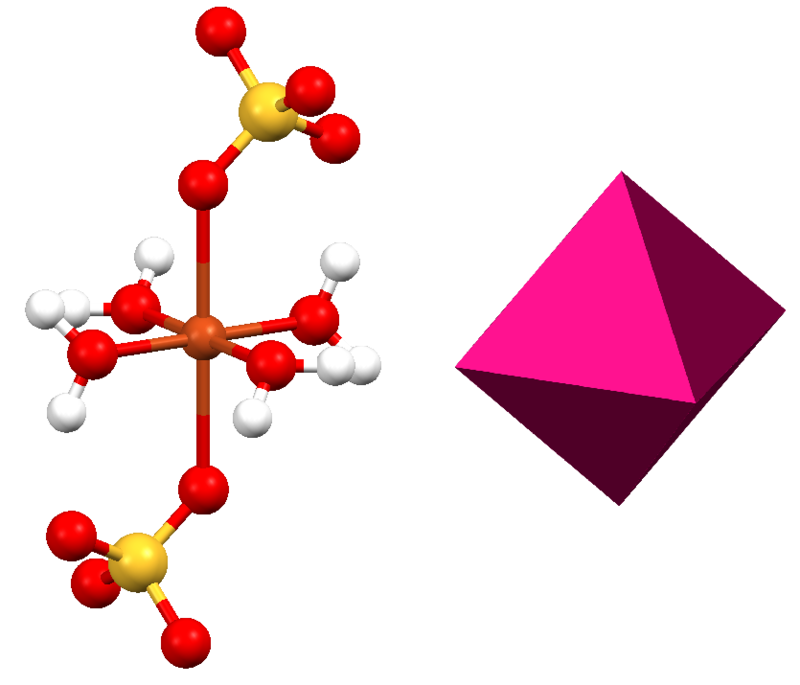 The atomic structure of copper(II) sulfate (left), next to an octahedron (right). The four oxygen atoms about each sulphur atom are arranged in a tetrahedron, the same shape as a pyramid-shaped teabag. The six oxygen atoms around the copper atom are in an octahedron – one at the top, one at bottom, and four in a square around the middle. Chemistry is full of tetrahedra and octahedra, because these are very efficient ways of arranging one spherical thing about another (and atoms are essentially spherical). This was appreciated as far back as ancient Greece; the tetrahedron and octahedron are two of the Platonic solids, named after the philosopher who theorised that the classical elements (earth, air, fire and water) were made from these shapes. Copper sulfate is used to test blood for anaemia (R. A. Phillips et al., J Biol Chem., 1950, 183, 305-330), by putting a drop of blood into a solution of copper sulfate of known concentration. The copper sulfate solution has a known density, and seeing whether the drop of blood rises or falls gives an indication of its density – normal blood should sink to the bottom of the solution, but anaemic blood is lighter than normal due to a lack of haemoglobin, and either floats or rises. and to this day it is still used in veterinary styptic powders (a styptic is something that can be used to stop bleeding). 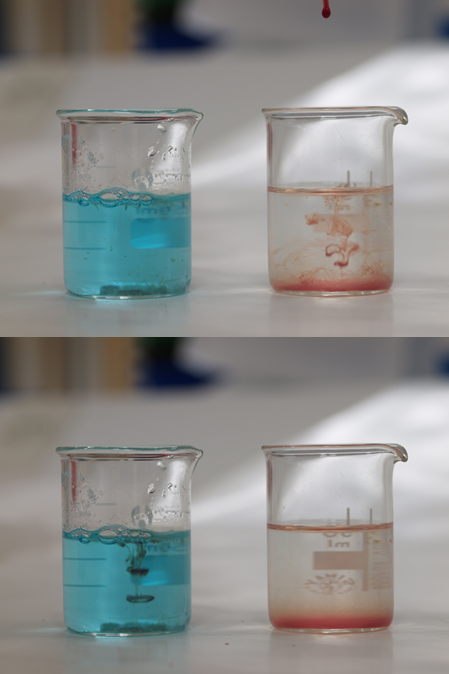 Blood disperses when dripped into water (right) but forms droplets when dripped into a solution of copper sulfate (left). An albumin curled up (above) and uncurled (below). 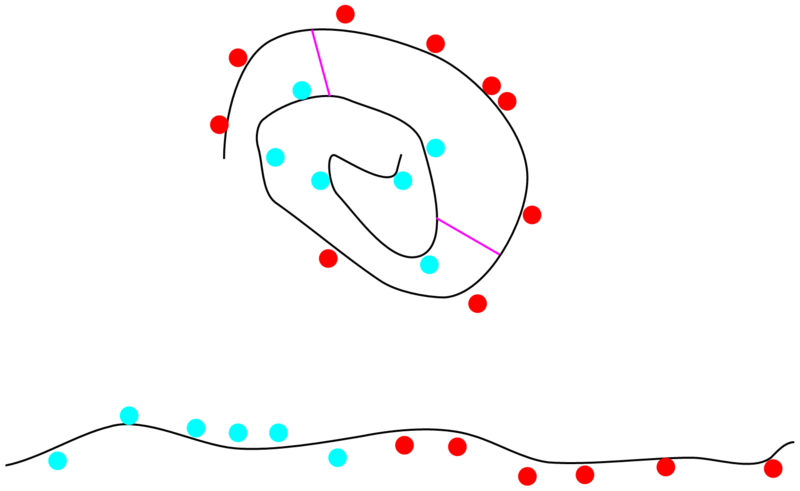 When an albumin is curled up, all the hydrophilic parts (red) are on the outside and the hydrophobic parts (blue) are hidden, so the protein will dissolve. If it uncurls, the hydrophobic parts also become exposed and the protein loses its solubility. The blood test works because of a reaction between copper ions and a component of the blood called albumin. Albumins are proteins that are globular in shape, and this shape bestows water-solubility upon the protein – all the bits that interact nicely with the water (hydrophilic is the scientific term) are on the outside, and all the bits that don’t like water (hydrophobic) are tucked away on the inside. The copper ion destroys this structure and makes the proteins become insoluble – they precipitate, which has the effect of making the blood coagulate. 3) The same principle also finds use in the preparation of meringues; it has long been known that using a copper bowl makes it easier to make meringues. Meringues are made by beating together egg whites and sugar, and can be tricky to get right – the secret is in beating them just enough to stiffen them, and not so much that they become lumpy and collapse. Egg whites are basically a mixture of albumins and water, and when you beat them you make the albumin proteins unravel. When they unravel, they can trap air and water between them, and essentially you end up with a protein mesh containing bubbles of air and water – these bubbles give meringues their fluffiness. However, if you overbeat the mixture then you force the air and water out of the mesh and the proteins start sticking to each other instead of the air and sugar. This gives lumpy meringues. The use of a copper bowl has been held to produce better meringues. The theory is that copper reacts with one of the proteins, called conalbumin, in the egg whites – the biological function of conalbumin is to sequester metallic impurities in the egg, so it is particularly suited to reaction with the copper. The structure of conalbumin is due in part to a kind of bond called a disulphide bond; there are many of these, and they act like the spokes of a wheel, holding different parts of the protein together at the right distance (represented in purple in the above diagram). The copper breaks these bonds (G. K. Oster, Nature, 1971, 234, 153-154) and sticks to the sulphur atoms, allowing the protein to be stretched out to make the fluffy mesh. Not only does the copper do this, but because the albumins are stuck to the copper they can’t stick to each other, preventing lumpiness. 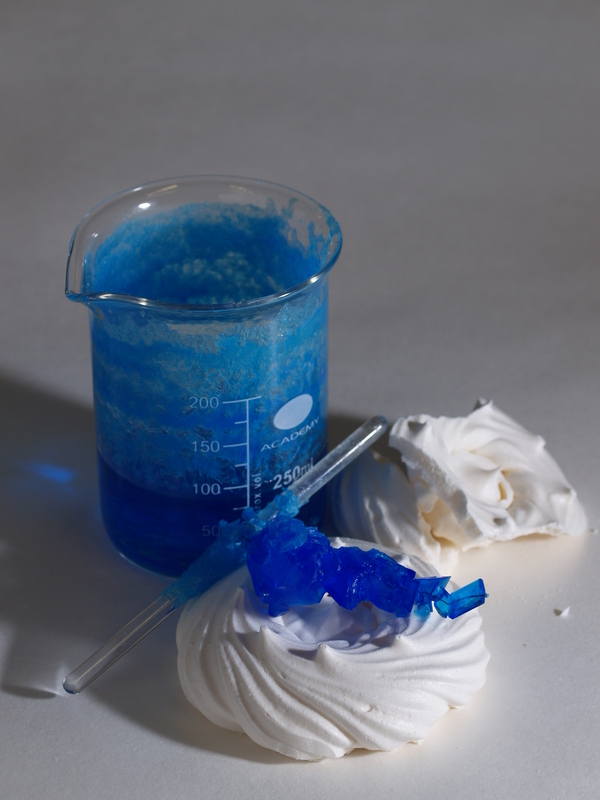 Meringues and copper sulfate crystals. Contributors: Chris Adams (research, ideas, structures and words); Jenny Slaughter (editing); Ian Nichols (photographs). 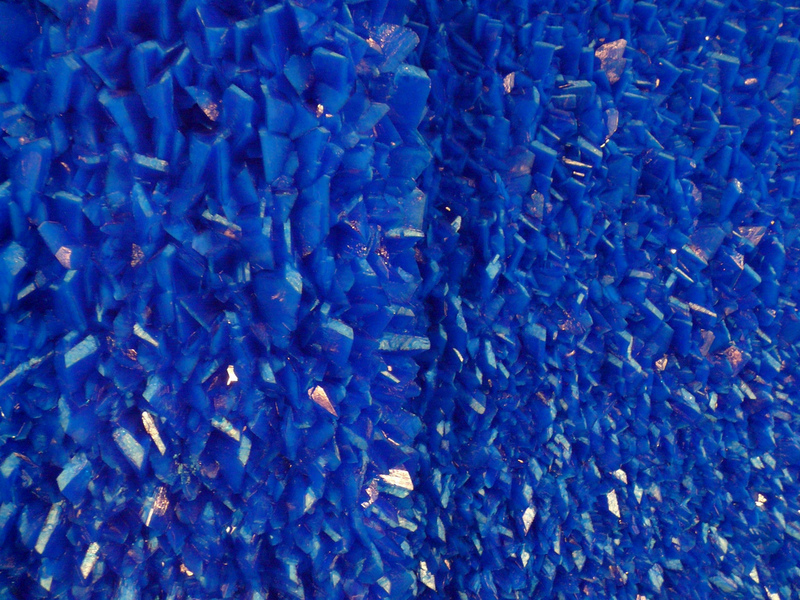 We would like to thank Roger Hiorns and “la fattina”, for allowing use of their photographs under Creative Commons. Our thanks as well to Don Hayes Butchers for providing some of our materials. *Well, once the crystal structure has been determined. Categories: Biochemistry, Colours, Cookery, Copper, Food, fungus, Herbicide, inorganic, Materials, Medicine, Metals, Organic, Pesticide, Poison | Tags: biochemistry, chemistry, cooking, copper sulfate, food, herbicide, inorganic, organic, pesticide, pharmaceutical, science | Permalink.